Remote, pristine & unique, the combined Tsarap & Zanskar rivers flow 300km through the Zanskar range starting at a high elevation of over 4000 metres finally meeting the mighty Indus river. The Zanskar flows undisturbed through one of the world’s great untouched canyons, past communities which have changed little in the past few hundred years. With a put on at over 4000m, this is a true high altitude expedition, featuring endless class 3-4 rapids, hidden away in India’s remote Himalaya. After travelling to the region, you’ll spend a few days acclimatising to the altitude, giving the chance to take in ancient temples and the surroundings of Leh. Once on the river, you’re in for one of the Himalayas’ finest class 4 multi day adventures. The Tsarap alternates between open terrain and box canyons, before joining the mighty Zanskar for big volume in a vast, pristine canyon. One of the trips highlights is a visit to the Phuktal monastery – built into a cave half way up the canyon wall, and accessible only by river or a week long hike, this Buddhist community has remained almost unchanged for the past 800 years. The trip will be led by an experienced Gene17kayaking appointed trip leader. In selecting suitable leaders, we not only look to ensure that they have the relevant qualifications but we also ensure that they have an excellent track record of white water paddling from around the world. Whilst qualifications and experience are essential requirements, we also make sure that our leaders have the right temperament to lead a trip group comprised of individuals who have a range of previous experience and expectations. The leader is a vital contributor to the enjoyment and well-being of the trip members and he or she will be there to deal with any unexpected problems. To that end, we aim to provide a leader who will make the trip both successful and enjoyable throughout. 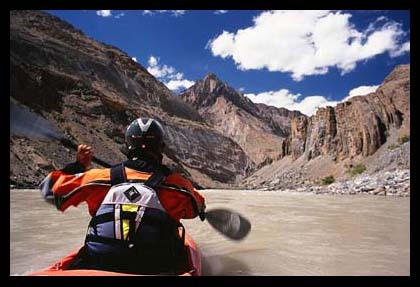 Tsarap Zanskar Multi Day Adventure takes place on Class III+/IV+ whitewater. The Tsarap Zanskar Multi Day Adventure is suitable for experienced paddlers who are able to paddle for 4 – 6 hours in a day on Class III/IV. Generally the rivers are accessible with far road access, and there will be some exposed terrain. This trip begins on an easier section of whitewater, but will soon reflect conditions expected at the grade. Participants should therefore expect to be in a river environment during peak runoff for sometimes extended periods of time.